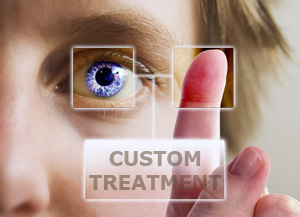 Unlike conventional LASIK where lasers apply a uniform power of treatment across the patients cornea, similar to a contact lens; CustomVue technology, developed by VISX allows the doctor to customize the treatment strength across the surface of the eye based on each individual patient`s unique optical variations and imperfections. This ground breaking procedure is made possible by using Wave-Front technology. This technology maps the optical properties of the entire eye creating a 3D map of the unique imperfections of each eye. Dr G.N.QURESHI (yes, Dr. G.N. Qureshi is the one who plans the treatment) is then able to customize a precise treatment after acquiring multiple maps of each eye. The CustomVue plan is then fed to the laser for the actual treatment. During the treatment the CustomVue treatment is lined up an centered with extreme precision using landmarks.